There are a lot of pictures of St. John the Baptist as a young boy, looking all cute and playing with Jesus. St. John the Baptist in the Wilderness, by Caravaggio, c. 1604-05. Nelson-Atkins Museum of Art, Kansas City, Missouri, United States. This is a picture of St. John the Baptist, not as a child, not as an adult, but as a teenager. In this picture, he has left home and entered the wilderness. The colors are dark and he’s brooding about his life and the vocation that God is calling him. He wears clothes made of camel skin and carries the reed staff which looks like a cross — a common image for St. John the Baptist in art, as he points the way to Christ. Behind him is an oak tree, which is a symbol of strength and endurance. 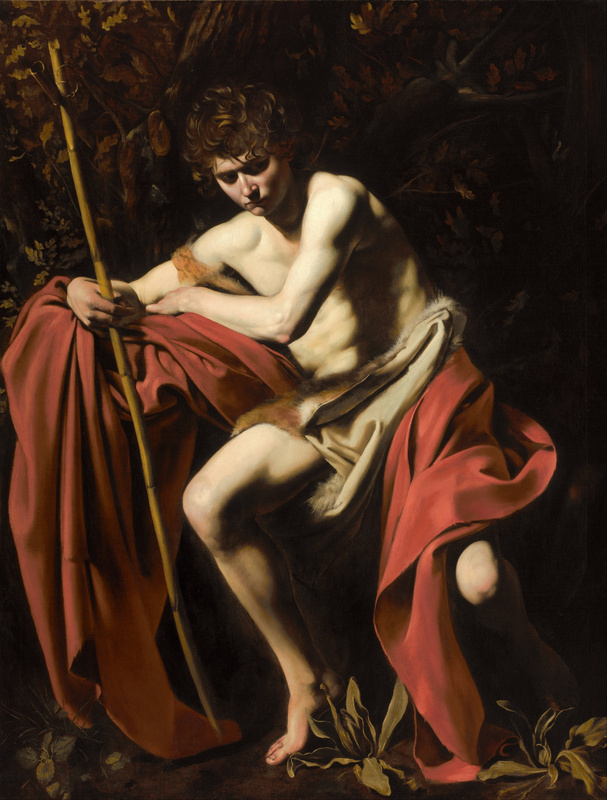 Maybe it’s because I did a lot of peer mentoring with teenagers a couple of years ago, but this picture of St. John the Baptist by Caravaggio struck me profoundly. The teen and young adult years often get dismissed, especially by older adults, as being unnecessarily dramatic and emotional. What can I say? Many teenagers and young adults brood a lot! And yet… there is good reason for that. Teenagers and young adults are still figuring out where they stand in the world. They feel the tug to leave their parents and join the world. But they aren’t sure how to break away. They aren’t sure how to establish themselves. They are afraid of the various pitfalls that they know that the world will present for them. And many of them are unsure of what they are called to do. Much of the brooding comes from trying to discern that vocation, trying to find out who they are, and trying to figure out how to act in a proper manner to live out their lives the best they can. For Christians, there are other questions: what is it that God wants me to do? How can I live out my way in accordance with God’s will? These are not light questions at all — in fact, many older adults struggle with these questions too. But for a teenager, these questions come to sharp focus, especially because they are at that edge of the cliff in which their every choice and action will define them for who they will grow up to be, for better or for worse. And they are very cognizant of this fact. And I think that this picture, in many ways, responds to that age-old question. Though St. John the Baptist is still, there is clearly a torrent of thoughts going through his mind. And yet. He still holds onto the staff, which represents his special vocation to God. He sits under the oak tree, which symbolizes a deep-rooted faith in God. And he waits with a peculiar stillness in the desert, waiting for the call of God. So, if you’re a teenager or a young adult, the best advice that I have for you is wait. Pray. Have faith. You are alone in the desert right now and, yes, the desert is a scary place to be. But have faith anyway and listen for the word of God. It’ll be quiet for a while, but eventually you’ll hear that still, quiet voice. And when you hear it, follow Him.